Could you survive in the wilderness? Netflix is letting its viewers put their survival skills to the test in its next crack at interactive television, this time featuring the celebrity survivalist Bear Grylls. The show, named You Vs. Wild, looks like a spin-off of Grylls' Man Vs. Wild – which saw him face the dangers of nature with nothing but a camera crew (and probably various unseen safety measures) to look after him. Launching on April 10, You Vs. Wild will follow a similar format to Black Mirror: Bandersnatch, last year's surreal sci-fi thriller about a video game designer who starts to lose his sanity. Bandersnatch let users choose their own path through a complex, branching narrative, offering choices on everything from what you have for breakfast (Frosties, obviously) to more high-stakes acts of violence. 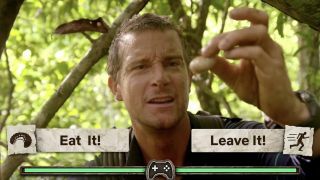 In the trailer below, Grylls is seen facing a number of natural threats – cliff faces, mountain lions, and suspicious looking grubs among them – as he tries to find his way "back to civilization". But this time, he says, "my adventure is up to you". Given that Bear Grylls is, you know, a real person, we don't expect to see mountain lions tearing his torso to shreds. But it looks like we'll be able to choose what dangers he faces, how he avoids or faces them, with a variety of 'good' or 'bad' outcomes. Maybe a tasteful cut to black when things go wrong? Netflix is betting big on interactive fiction, with a host of rumored shows in development using the Bandersnatch format. Viewers have more choice than ever between various streaming platforms, and with the likes of Disney Plus and Apple TV Plus both set to launch in the coming year, Netflix will have to work hard to make sure it offers something distinct from the competition. The Bear Grylls collaboration shows just how varied a library Netflix is aiming for, but will it be enough to keep users on the streaming platform? That choice... is up to you.